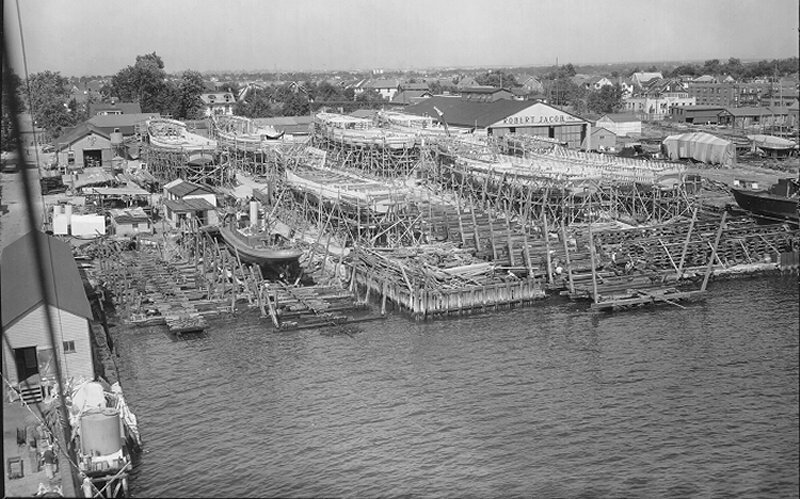 ↑A view of the Robert Jacob Shipyard, City Island, NY, c. July 1944, which shows Harbor Tugs, Vospers, and YMS Auxiliary Motor Minesweepers under construction. In 1946 the Robert Jacob Shipyard was sold to Consolidated Shipbuilding of Morris Heights. Consolidated then over a 2 year period relocated completely to City Island. Consolidated remained in business until 1957-58, was then sold to Wes Rodstrom who operated the yard from 1959 to about 1963 as Rodstroms Yacht Yard then changed the name back somewhat to Consolidated Yacht Yard. Today Consolidated Yacht Yard is still owned by Rodstrom family. Photo courtesy of the City Island Nautical Museum and Tom Nye. Image courtesy of NavSource.